I recently joined my aunt, who has spoiled me with many wonderful travel experiences, on a two-week guided tour of Israel. Our side of the family (my father’s side) is Jewish with Eastern European ancestry, while my mother’s side is Scots-Irish Presbyterian. But our trip was not a religious one. Rather, we went to get a first-hand sense of the many layers of history, culture and identity in a fascinating and eternally conflict-ridden part of the world. 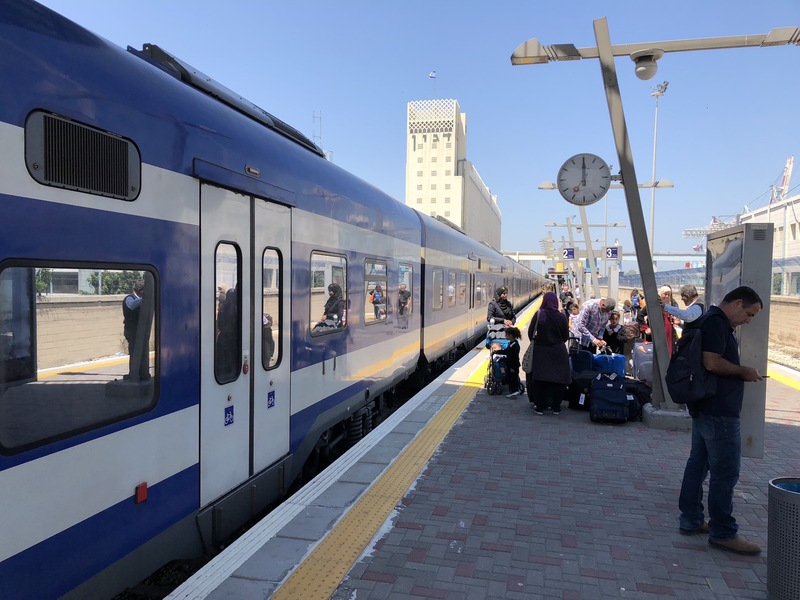 And although seeing and riding trains was far from the central purpose of our visit, I was able to work in some of that and got a sense of rail’s evolving role in the economy and life of a 70-year-old country. A south or eastbound Israel Railways train formed of Bombardier bilevel coaches approaches Tel Aviv HaShalom train station on April 24, 2018, operating in the median of the Ayalon Highway. Note that IR generally practices left-hand running, a relic of pre-1948 British control of the railways. All photos by Malcolm Kenton. 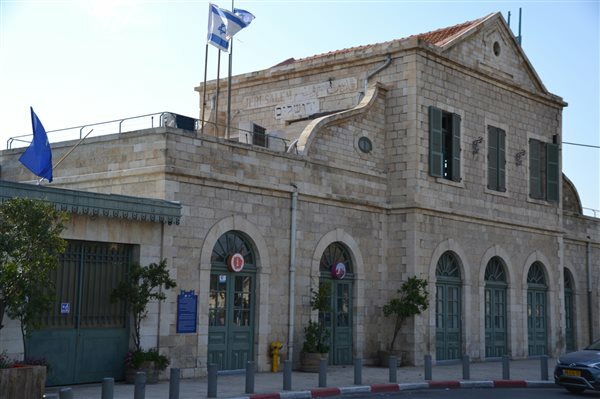 Israel Railways was formed in 1948, the same year as the State of Israel began, and remains a state-owned company. It took over, and has since greatly expanded, but has also seen partially contract, the pre-existing rail network built by the Ottoman Turks and the British, which had been called Palestine Railways. IR now operates 707 miles of track and is in the process of electrifying the core of its network, which is currently entirely diesel-powered. Its passenger trains carried more than twice as many passengers as Amtrak did in 2017, despite only operating six days a week and competing with a world-class highway system. The railway’s logo is formed by interconnected lines, symbolizing a track crossover in the shape of the Star of David, the centerpiece of Israel’s flag. The coastal main line was once part of a network that connected to Beirut, Lebanon to the north and Cairo, Egypt to the south via Gaza, but those links were severed and lines abandoned as the political situation worsened between the new Jewish state and its Arab neighbors. The Jezreel Valley Line between Haifa and Beit She’an (a city that was a trading center dating back to Roman times) once connected through to Damascus, Syria and then on into Turkey to connect with the greater Eurasian rail network. It was closed in 1948, but reopened as far as a new station west of the center of Beit She’an in 2016. Two ABB Scandia DMU trains meet at a siding on the mostly single-track section of the original Jaffa-Jerusalem Line between Bet Shemesh and Jerusalem on May 1 2018. 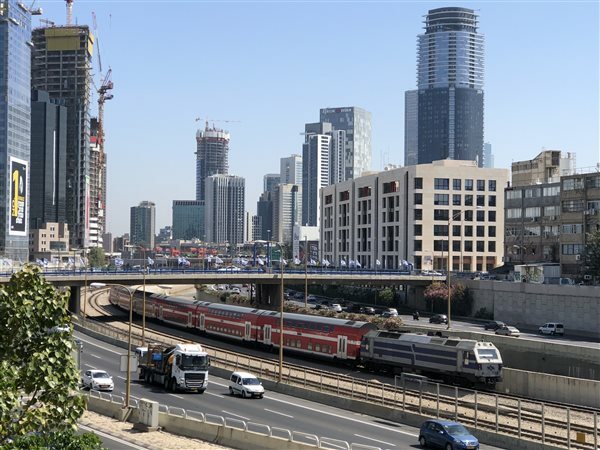 Israel’s first true high-speed rail line, connecting Tel Aviv to Jerusalem via Ben Gurion Airport, is set to open later this year. It will cut the travel time between the country’s two biggest cities to just 30 minutes. 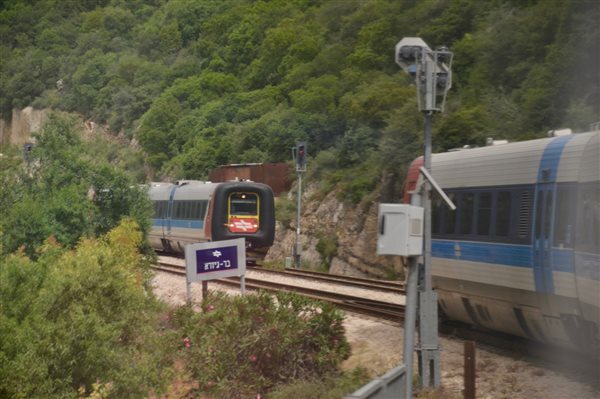 The current trip, over a winding mountain railroad built by a French company under Ottoman direction in 1892, part of the original Jaffa-Jerusalem line, takes 1 hour and 45 minutes and involves a change of trains at Bet Shemesh. 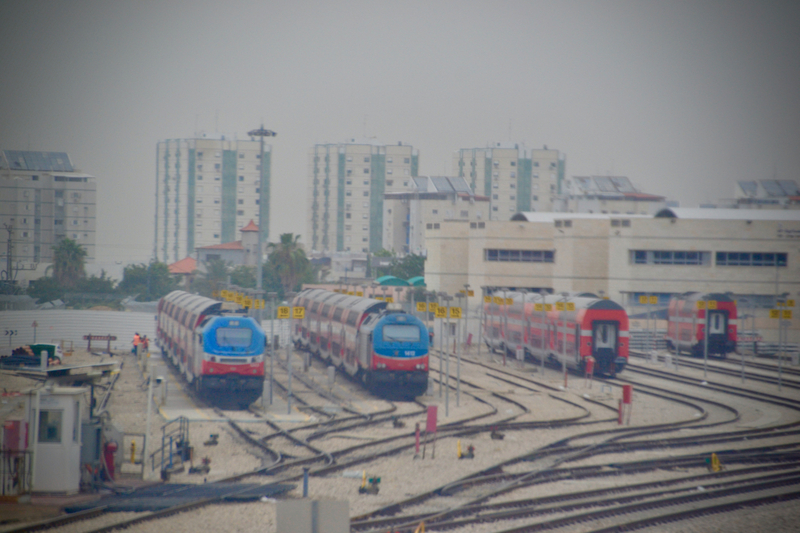 While most of the network uses diesel-hauled passenger cars (either red-painted Bombardier-built bilevels or blue-painted Siemens-built single-levels), the Bet Shemesh-Jerusalem segment uses blue-pained single-level Danish-built ABB Scandia IC3 Diesel Multiple Units in four or six-car consists. The current Jerusalem Malha terminus is next to a soccer arena and shopping mall in the city’s southwest, but the high-speed line will terminate next to the current intercity bus depot, which is more centrally located in West Jerusalem (the modern, predominately Jewish part of the city) and is connected to the 8.6-mile light rail line that opened in 2011 and is planned to be one of four such lines in the city. Both original 1892-built termini in Jerusalem (near the Old City) and Jaffa are now the centerpieces of dining, shopping and entertainment centers. 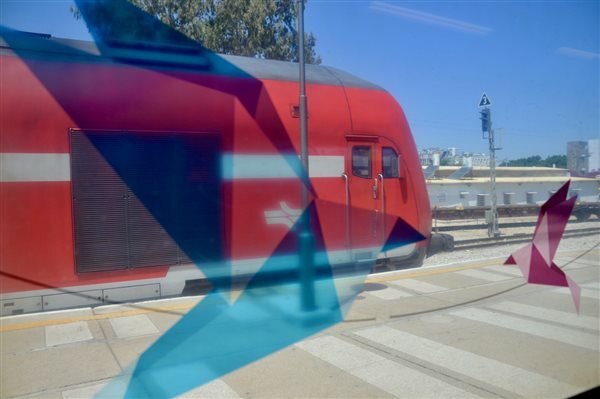 The rear of a southbound Bombardier bilevel train is seen through the window of a northbound Siemens single-level train, which is decorated with colorful origami birds. From an American perspective, a ride on IR feels most like a train ride in Europe, from the high frequencies (shorter segments run every 30 minutes while longer ones run hourly) to the off-board fare payment (most stations have fare gates activated either by inserting a paper ticket or touching a contactless Rav-Kav farecard, but conductors do occasionally also do on-board ticket sweeps) to the smooth and relatively fast ride (the current top speed is 90 mph) and the need to push a button to open the train doors. 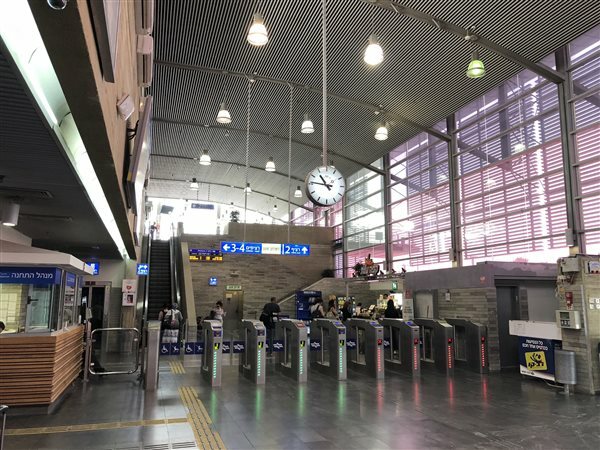 There is service every 15 minutes between downtown Tel Aviv and Ben Gurion Airport, a ride that takes 10 minutes. There is a considerable amount of freight traffic on the coastal main line — both container trains delivering consumer goods from the ports of Haifa and Ashdod and trains carrying mined minerals to the ports from the Dead Sea area — but all movements are based on a schedule so that one does not interfere with the other. IR still largely uses left-hand running in the British tradition, despite Israel's road traffic using right-hand operation. Passengers must pass through a security checkpoint at the sole entrance doors to most stations, but the inspection is very cursory compared to airports, and even to entering most federal buildings in Washington. No need to remove hats, jackets, belts or shoes. Uniformed Israel Defense Forces soldiers, many carrying assault rifles, are a common sight in stations and on trains — two years of military service are compulsory for all Israeli citizens, generally beginning at the age of 18. The entire rail system shuts down for the Jewish Sabbath, from about an hour before sundown on Friday night until early Sunday morning. 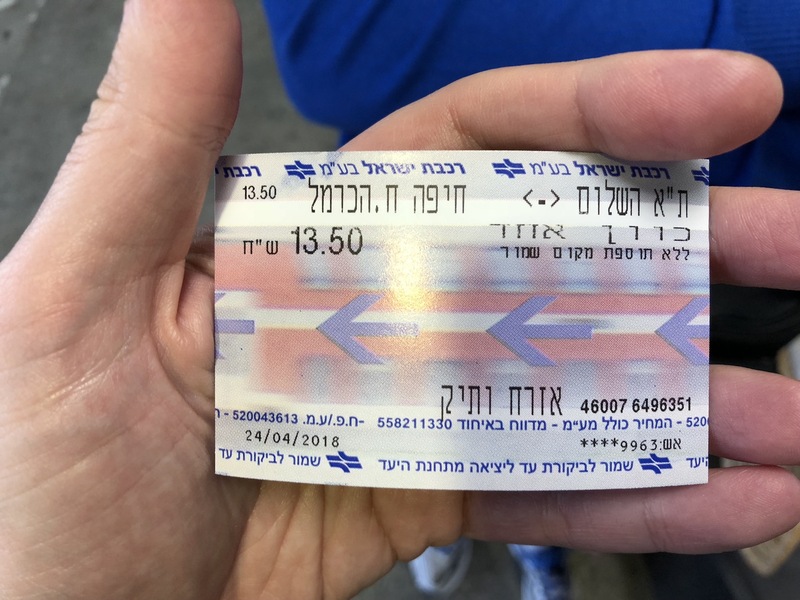 Most signage and all departure boards are in both Hebrew and English (some are also in Arabic), though nearly all public address announcements, both in stations and on trains, are made exclusively in Hebrew, and printing on tickets and receipts is only in Hebrew, though the ticket machines can be switched to English or Arabic. 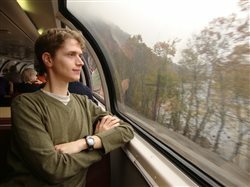 There is no first or business class seating on the trains, but there is one quiet car on most trains and there are one or two cars on the north end of each train offering reserved seating. Passengers can either pay a very small fee on top of the fare to reserve a seat in one of these cars, which are generally less crowded, or can ride in any of the other cars where seating is unreserved. A view of the Mediterranean Sea from a northbound IR train about 5 miles south of Haifa. There are some scenic highlights among IR’s passenger routes. From just north of Benyamina, around the point of Haifa (which reminded me of riding the Amtrak Cascades through Tacoma, Wash.) and up to Acre, the northern coastal line hugs the Mediterranean Sea shore, with views echoic of the Coast Starlight scraping the Pacific through central California. The journey between Bet Shemesh and Jerusalem is a classic mountain railroad hugging a stream (most of which is dry most of the year), filled with curves and tunnels, and reminds me of many western US routes. And the ride from Tel Aviv south to Beer Sheva goes through rolling farm country dotted with small towns, kibbutzim and moshavim (two types of collective farms) that resembles the Great Plains. Another point of interest not on most tourists’ itineraries is the Israel Railways Museum in Haifa. Located along the main line near the original Haifa East station, it is a short taxi ride from the current Haifa Central station — but a visit requires entry to IR property through a security gate and surrender of one’s driver’s license to the guard (to be retrieved upon exit) if one wishes to park next to it. It is a relatively small museum that takes about 90 minutes to fully experience. 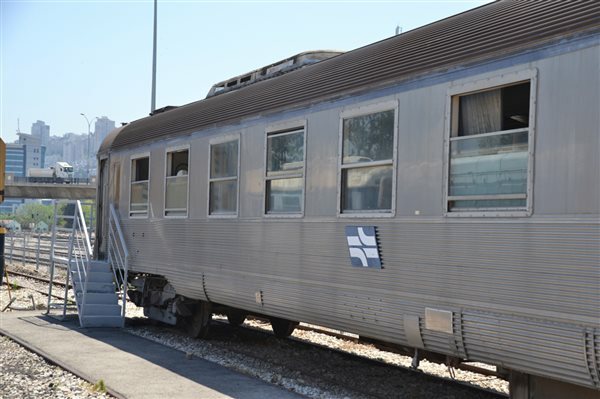 It has many railroad artifacts and photos from the Ottoman and British Mandate periods, and static equipment ranging from two small steam locomotives to a 1910s wood-paneled office car to British and French-built passenger cars and diesel locomotives from the 1950s through 1970s. Unfortunately, there is no preserved historic equipment that operates in Israel, either on main lines or on separate preservation railways. A northbound train formed of Siemens single-level cars stops at Haifa Central HaShmona station on April 24, 2018. 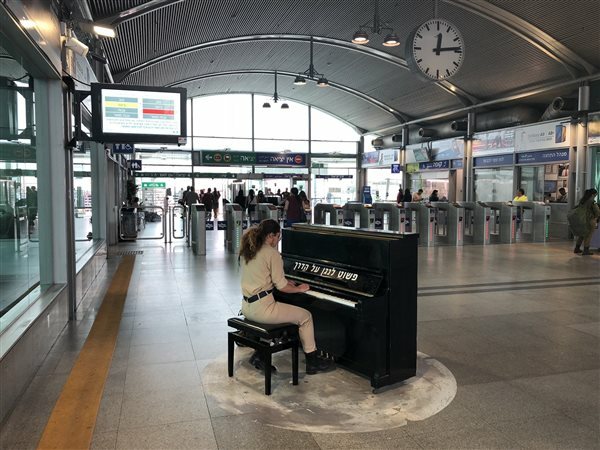 The interior of the new Beer Sheva North-University station in the south of Israel. A woman plays "Chattanooga Choo Choo" on a free public piano in the main hall of Tel Aviv's HaHagana train station on May 4, 2018. Example of a paper ticket on Israel Railways - this one for unreserved coach travel from Tel Aviv to Haifa on April 24, 2018 for a fare of 13 shekels and 50 cents (about $3.85 in US dollars). 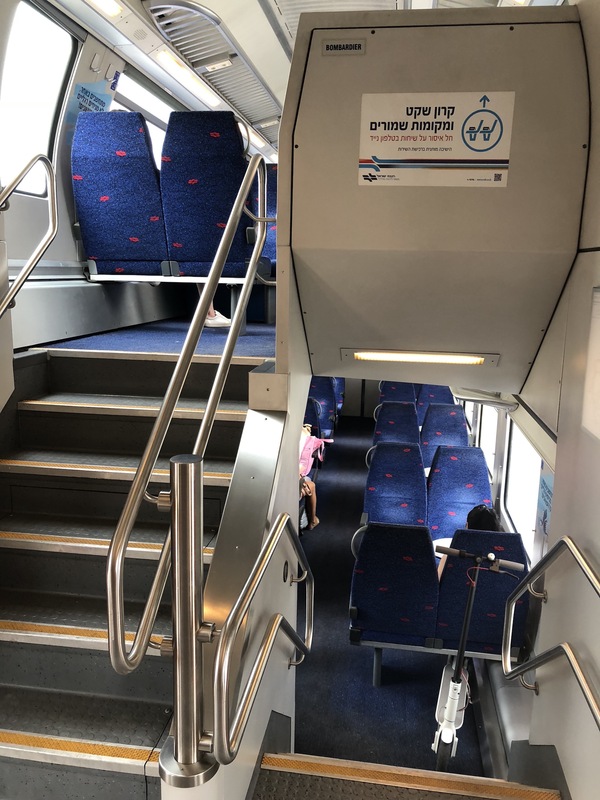 The interior of a Bombardier bilevel coach - the northernmost on a train from Beer Sheva to Nahariyya on May 4, 2018. 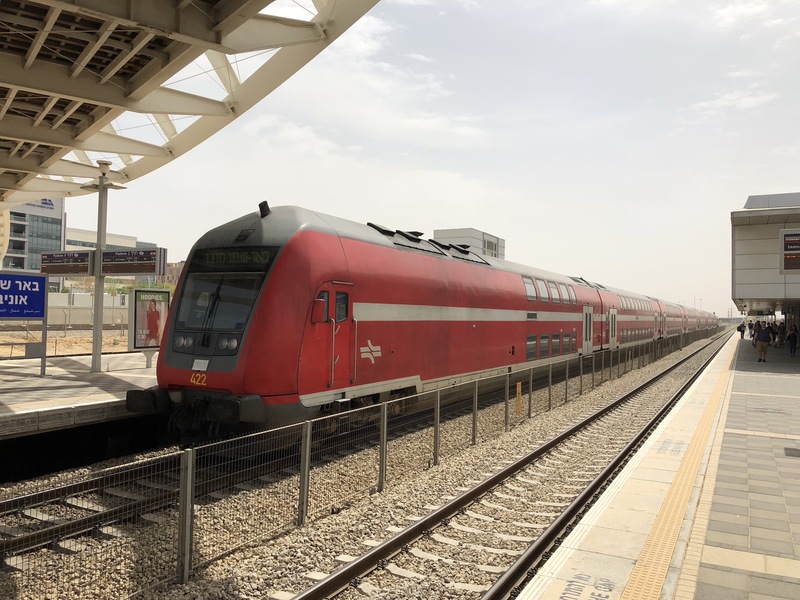 The north-facing cab car of a southbound train stopping at Beer Sheva North-University station on May 4, 2018. Four bilevel passenger consists rest in the IR coach yard in Lod, Israel on May 4, 2018. British-built 0-4-0 locomotive no. 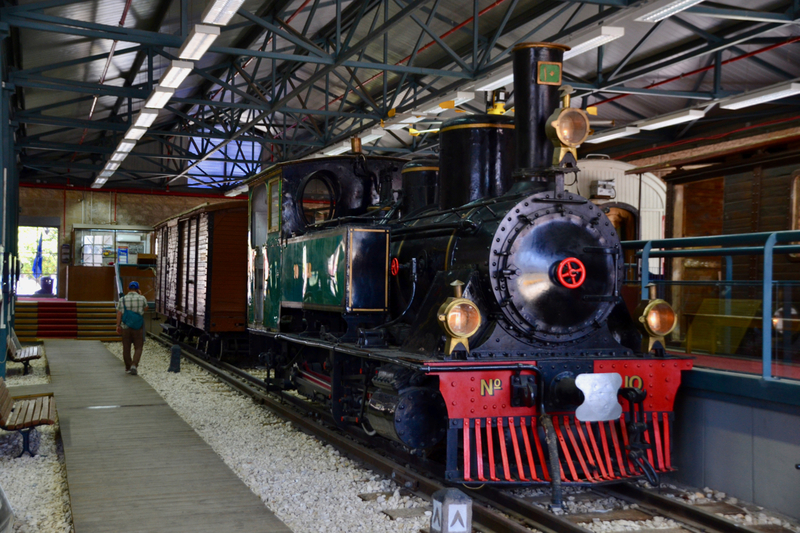 10 on display at the Israel Railways Museum in Haifa. 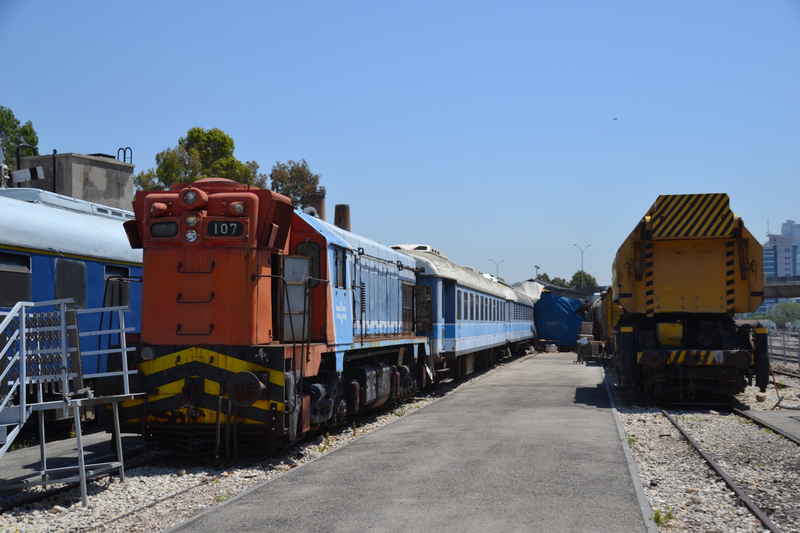 Retired IR diesel locomotives at the Israel Railways Museum. A 1950s British-built stainless steel intercity coach sold to IR in the 1970s, now on display at the Israel Railways Museum. The 1893 Ottoman-built central Jerusalem station, which now houses a restaurant as part of a large, popular dining and entertainment complex.